CD production for this project was a real group effort. The band recorded many instrumental and vocal tracks at SLU or in their own homes, and we recorded the remainder here in the Robison Productions studio. Band member Randy Settoon mixed the “Lipstick” disc (the first ten tracks), and I mixed the “Whiskey” disc (the final ten tracks). All-in-all, it was a rockin’ good time. 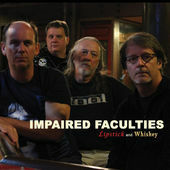 Lipstick and Whiskey is available on iTunes, CD Baby, and other online outlets. For more information about the band, upcoming shows,and charity events check out their website and Facebook page. Previous Previous post: New Music for Viola on Centaur!